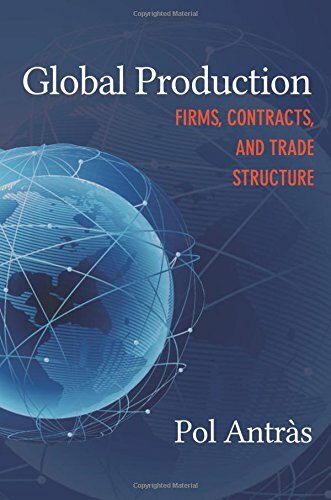 Global Production is the first book to provide a fully comprehensive overview of the complicated issues facing multinational companies and their global sourcing strategies. Few international trade transactions today are based on the exchange of finished goods; rather, the majority of transactions are dominated by sales of individual components and intermediary services. Many firms organize global production around offshoring parts, components, and services to producers in distant countries, and contracts are drawn up specific to the parties and distinct legal systems involved. Pol AntrÃÂ s examines the contractual frictions that arise in the international system of production and how these frictions influence the world economy. AntrÃÂ s discusses the inevitable complications that develop in contract negotiation and execution. He provides a unified framework that sheds light on the factors helping global firms determine production locations and other organizational choices. AntrÃÂ s also implements a series of systematic empirical tests, based on recent data from the U.S. Customs and Census Offices, which demonstrate the relevance of contractual factors in global production decisions. Using an integrated approach, Global Production is an excellent resource for researchers, graduate students, and advanced undergraduates interested in the inner workings of international economics and trade.